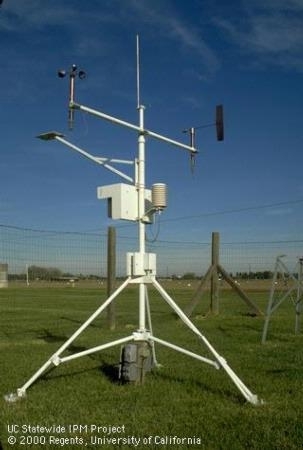 Soil moisture sensors fall into two broad categories, volumetric and tensiometric methods. One tells you how much water is in the soil and the other tells you how tightly the soil holds on to the water. Volumetric methods require a calibration of the sensor to the soil, whereas tensiometric is good to go when installed. For both methods, the grower learns to keep soil moisture within a given range of values and, in theory, the plant is kept in a better condition with improved health and yields and potential improved irrigation efficiency. The most common volumetric methods rely on utilizing the dielectric constants of the soil and water, with water’s dielectric constant being much greater than soils’. The velocity of an electromagnetic wave or pulse depends on soil moisture content. These sensors have become widely used because they have a good response time, do not require maintenance and can provide continuous readings, allowing for automation. There are several different methodologies used: Time Domain Reflectometry, Frequency Domain Reflectometry (Capacitance), Amplitude Domain Reflectometry (Impedance), Phase Transmission, and Time Domain Transmission. There is quite a range in: (1) prices for these different devices, (2) requirements for calibration with soil moisture content, and (3) requirements for close soil contact. Some devices are affected by the chemical nature of the soil. Even if they are not calibrated they can be used as relative change in moisture content over time. The tensiometric methods include: Tensiometers, Gypsum Blocks, Granular Matrix Sensors, Heat Dissipation and Soil Psychrometer. These techniques require the sensor to come into equilibration with the soil moisture and generally are unaffected by soil salinity. Gypsum blocks and Granular Matrix are not very responsive in sandy soils and require good soil contact. These methods are less affected by salinity and do not require soil calibration, because they are reflecting the soil moisture tension the roots are seeing. All soil moisture sensors need to be placed in a position that represents the irrigated area. They need to be placed in the active root zone where water is applied and taken up and must be near trees representative of the whole irrigated area. They should not be next to a sick tree, a smaller tree compared to the other trees or be in an area that obstructs applied water (such as under a canopy that intercepts applied water). It is always best to reinforce sensor values with manual field measurements with a soil probe to ensure that sensor placement and response is truly reflective of what is going on in the field, before completely relying on the sensor values. As with all field equipment, occasional visual inspection of the field and sensor readings should be made to make sure the situation has not changed, such as an emitter has clogged or broken near the sensor. These sensors can be purchased individually and installed by the grower, or increasingly there are companies that provide a monitoring station that includes soil moisture, sensors for estimating plant evapotranspiration , data logger and software that determines an irrigation schedule for the crop. Some of these systems are outright purchase and some are for lease. In the future, there will be affordable satellite imagery that can help in irrigation scheduling, showing how rapidly this technology is changing.